April | 2013 | Mike Lamberti, From Margate To Cleveland, And Back ! Mike Lamberti, From Margate To Cleveland, And Back ! A look at sports, politics, A Summer Place at Margate, Montgomery Inn ribs, Rigatoni Quattro Formaggi at Patsy's, Air Force Academy football, 90210, the Cardinals and Rays, The Godfather, Jaws and Airplane! trivia, Hooters wings, the Browns first Super Bowl, or whatever else comes up…. 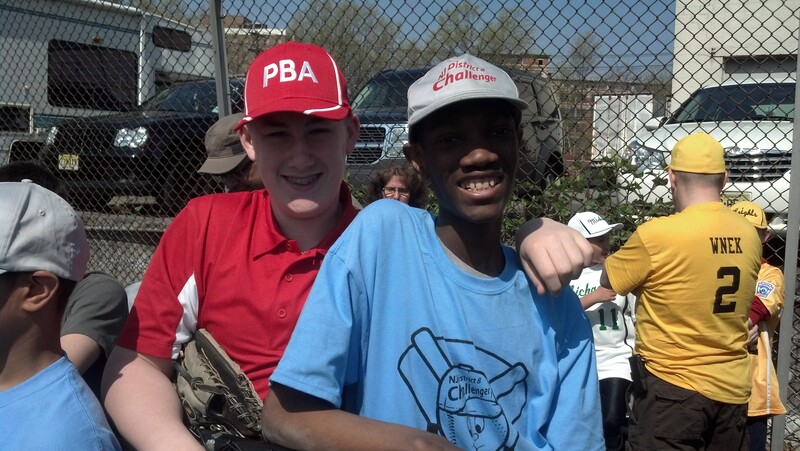 The community came together to watch the 2013 Challenger Baseball League start another season at J.R. Giebler Field on Floyd Avenue in Bloomfield. 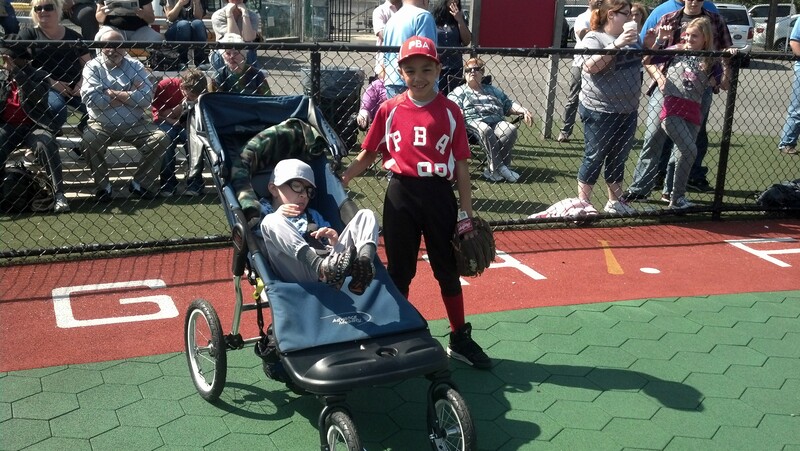 Members of the Belleville Little League joined the Challenger players for its Opening Day ceremonies. This is a lot more than young kids playing ball. It’s about the dream of a Belleville woman, Marge Franco, back in 1996 to find a league for her daughter to play baseball. Today, it’s the home where dreams are made every day, a place where adults’ eyes get moist, children laugh and Marge wears those dark sunglasses for more reasons than just the sun shining. 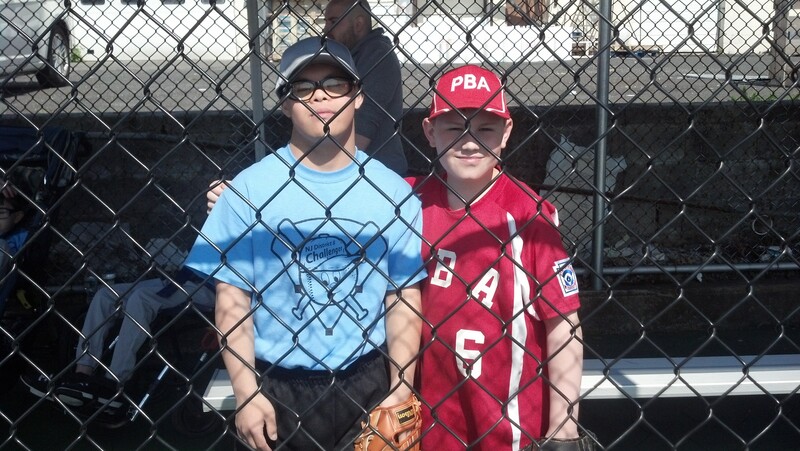 The Challenger League is for youngsters with ‘disabilities’, if you will, getting the chance to play baseball on Sunday mornings from April through the end of June. Some children are in wheelchairs, some wear leg braces or need the aid of crutches. No one makes an out and no one commits an error. Every player has a uniform. Everyone scores a run, everyone’s batting average is 1.000 and the look on a player’s face when he, or she, makes contact with a ball provides the fans a thrill that exceeds any trip to a Major League game. Giebler Field is named after William David ‘JR’ Giebler, who was killed on Dec. 21, 1988 on board Pan Am Flight 103 over Lockerbie, Scotland, in an act of terrorism. He was just 29 years old. The field was first opened when Franco organized the league in 1996 and refurbished to the gorgeous ball park it is today back in 2008. 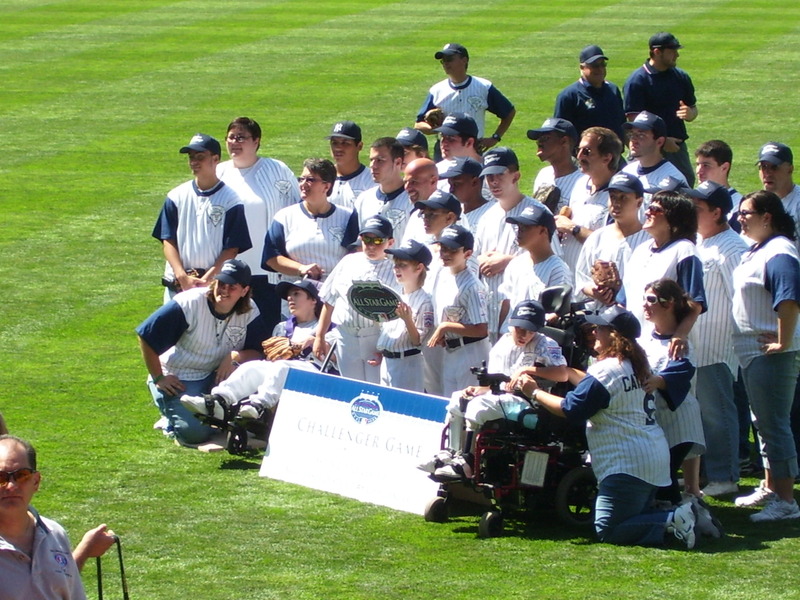 It was also in 2008 that Franco had the opportunity to take her kids to the original Yankee Stadium, not to see a game, but to participate in one. Marge’s team played a team from the Bronx in a game on July 10, 2008. The Yankees were hosting All-Star Week and this game would be the first event of the week-long celebration. Leading up to that day, the weather had been very hot and humid, but on game day, it was a perfect 78 degrees and sunny. Marge’s kids playing at Yankee Stadium on July 10, 2008. The Yankees went out of their way to make this a special event, building a make shift diamond in the outfield of the legendary park and posting each player’s name on the scoreboard. Every player got a swing and rounded the bases. When the game ended, the Yankees played Frank Sinatra’s traditional ‘New York, New York’ theme song. The teams shook hands and embraced one another. If you saw that, and didn’t have tears rolling down your face, something was wrong. After the game, the kids had a chance to eat lunch at Monument Park. As she begins her 18th season of running the league, Marge stays in the background. Her generosity is amazing. She arranges for all the fans and kids to have free hot dogs on opening day, as well as coffee and donuts for the adults prior to the start of the ceremonies. 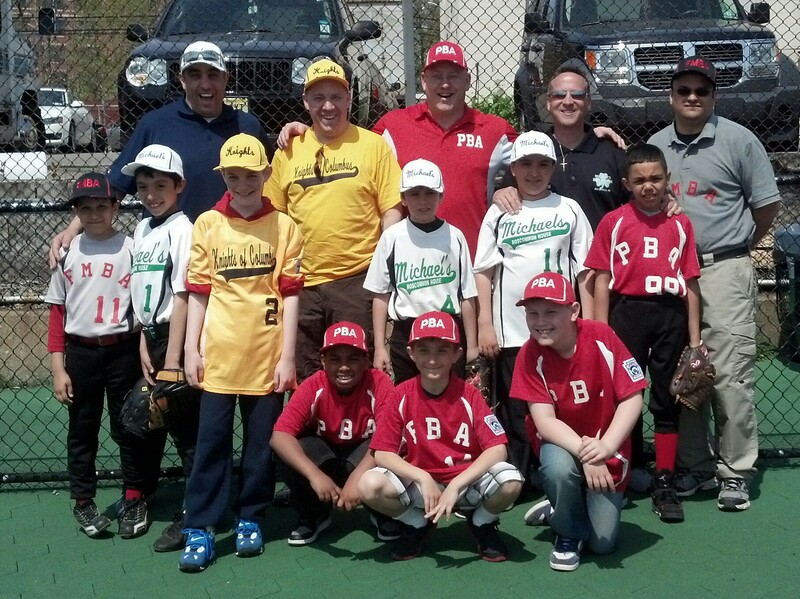 Bloomfield Mayor Raymond McCarthy never misses an opening day event. Many of Franco’s coaches have been a part of the team since the team’s inception. This season, players from the Belleville Little League, led by league officer Craig Jackowski, came by to support the festivities, as did the Caldwell College baseball team. Franco admits the opening day festivities can be overwhelming. 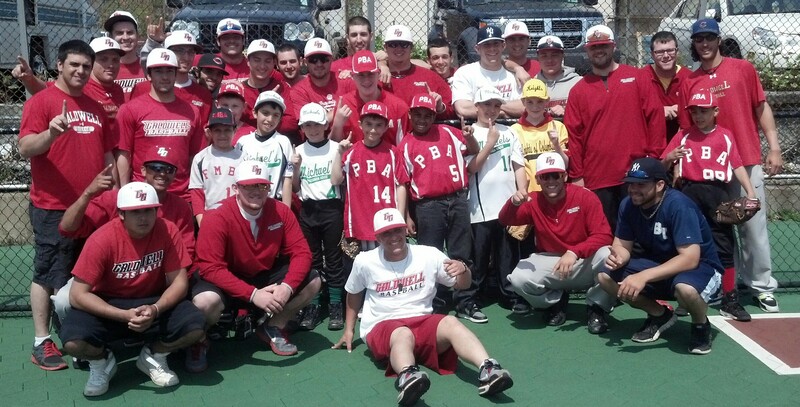 Thanks to the Caldwell College baseball team for their help in Opening Day fun today at the Challenger League. Carcich: What’s with the popcorn? Passaic Valley boys’ basketball coach Rob Carcich hasn’t attained the level of success he has without asking a lot of questions. So when Carcich started reading continued references to popcorn this spring on From Margate to Cleveland, he stepped to the forefront. After it was explained that it’s a Livingston softball tradition that I began a few years back, Carcich was satisfied. 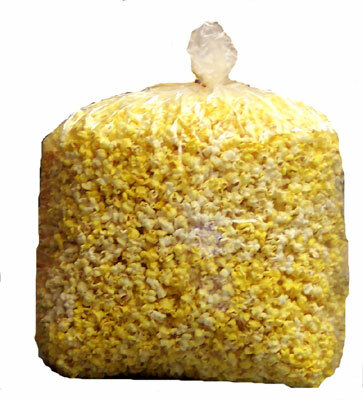 But after getting his latest edition of FMTC, with the Essex County softball update today, and no reference to popcorn, the questions started again. Well, it’s nice to see a Lancer tradition crossing over to Passaic County. Must be a green thing. 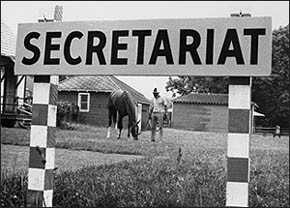 Oh, I shouldn’t dare make a Secretariat reference to Coach Carcich, should I? Then again, why not? He’ll tell you there may some studs on his 2013-2014 team next winter. There aren’t a lot of changes to the FMTC Top 10 in Essex County for this week. Livingston is still No. 1, as they’ve been since the season began. The Lancers take on No. 2 Mount St. Dominic, in Caldwell, on April 29 in a game that could decide the Super Essex Conference’s (SEC) American Division champion. Truth be told, the SEC, while a nice championship to attain, won’t change the top of the pecking order. Should Livingston not win the Essex County Tournament (ECT) championship on May 18 however, then maybe there could be a new No. 1, depending on who wins the title. (Another words, Mount St. Dominic would probably be the only team to jump ahead of Livingston, but would need to win the county title). Mount St. Dominic and Livingston both have one loss in SEC play, with Livingston losing an early season contest to Cedar Grove and Mount St. Dominic dropping its lone league game, at Livingston, the following week. Looking around Essex County the past week, it was kind of uneventful. The warm weather is beginning to take charge as May nears, which is always encouraging. Livingston started the week with a win over Bloomfield despite starting pitcher Jess Peslak being on the sidelines with a virus. The Lancers followed with victories over West Orange, Nutley and Edison, with Peslak back in the circle and spinning a one hitter against Nutley. Mount St. Dominic continued its winning ways, including out-of-conference wins against Blair Academy and Rutherford. Cedar Grove had a good week, including a win over West Essex while Nutley continues playing very well. The Raiders won a big game, under the lights last Friday, against Bloomfield, 3-2. And speaking of Bloomfield, Bob Mayer’s Bengals are clearly the team to beat in the Liberty Division, with a few coaches in the American Division, including Livingston’s Jason Daily feeling Bloomfield can be a major factor in the ECT. And don’t discount Newark Academy, which came out of nowhere last year to make it to the semifinals. Sergio Rodriguez’s team returns just about the entire team which excelled late last season and gained the seventh seed for this year’s tourney. Rodriguez has already said that Glen Ridge, who his team will face in the first round of the ECT, could be a factor, too. Montclair had a strange week, defeating Caldwell, but losing to Millburn. Columbia and West Orange both surprised Glen Ridge. So, here’s the latest Top 10. And don’t forget, the first round of the ECT is set for later this week. Some teams will play earlier than May 4, which is the traditional day to begin the first round because the SAT’s are being administered next Satrday. The quarterfinals are on May 11 at the home of the higher seed. 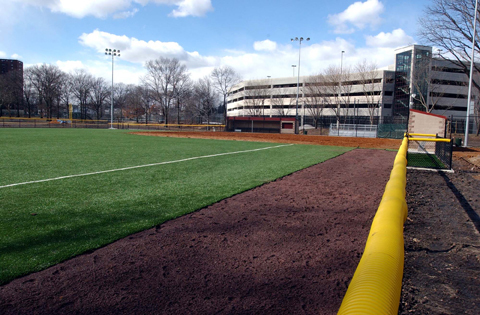 The semifinals and championship game are slated for May 17 and 18 at Ivy Hill Park in Newark. In the annals of Essex County softball, most in the know are aware of Jess Peslak’s dominance in the circle for Livingston High School. I’ll admit that I’ve run the gamut, calling her Secretariat because of the speed in which she throws a ball, as well as her overall competitive spirit, not to mention getting your popcorn ready for when Peslak pitches. Jess Peslak always seems to be smiling after a game. But there’s another side to her, the scholarly part, and one of the most prestigious organizations in New Jersey will be presenting her its highest honor on May 15 for her high school accolades as a student-athlete. Peslak will receive the Essex Award at the annual Men of Essex Dinner on Wednesday, May 15 at the Newark Airport Marriott Hotel. The dinner begins at 7 p.m. and tickets are $65.00 each. I first remember her as a freshman in 2010, with that scintillating fast ball, dark sunglasses and perpetual smile, after a win, or loss. She gained All Essex County honors that season and after a solid sophomore year in 2011, Peslak broke loose, in a Secretariat-type way last spring to finish 26-1, with a 0.32 ERA. She struck out 307 in 175 2/3 innings while waking 37, on her way to first team, All-State accolades. Peslak also had 19 shutouts, five no-hitters and nine one-hitters, and hit .324 as Livingston put together a 29-1 season, including conference, county and state sectional championships. This year, she’s pitching well again as the Lancers were 12-3 through games of April 24. Livingston also gained the top seed for the 36th Essex County Tournament and is tied with Mount St. Dominic for the Super Essex Conference’s American Division lead. The two teams will meet on April 29 for the second time in what could decide the conference title and may be destined for a third showdown in the Essex County Tournament final on May 18. Livingston coach Jason Daily was ecstatic for Peslak. 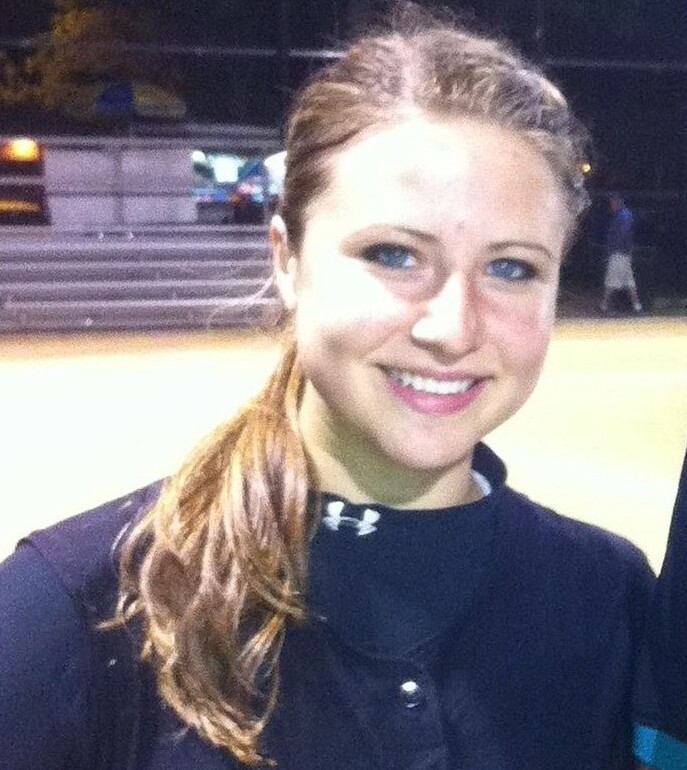 Peslak will attend Hofstra University, a NCAA Division 1 program, this fall, where she’ll continue playing softball. An excellent student at Livingston, she has aspirations to be an attorney, focusing on contract and tort law. She’s the daughter of Ed and Jean Peslak. 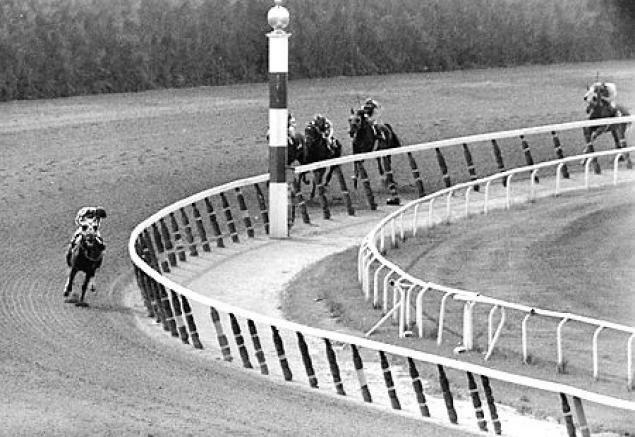 Secretariat’s dominance at the 1973 Belmont is often compared (by me) to Peslak’s work in the circle for Livingston. So, get your popcorn ready and gear up for next month, when the Triple Crown races begin again. GET YOUR POPCORN READY ! Livingston softball standouts Jess Peslak and Kylie McLaughlin will be among a group of standout student-athletes who will be honored by the Men of Essex on May 15. Peslak, a senior pitcher and McLaughlin, a junior outfielder, were both first team, Star-Ledger All State players in 2012 who led Livingston to a 29-1 record, including a NJSIAA, North Jersey, Section 1, Group 4 crown as well as the Essex County Tournament (ECT) and Super Essex Conference (SEC) championship. The two have been key to Livingston’s 12-3 start this season, as the Lancers are among the favorites to win a second straight SEC and ECT championship. 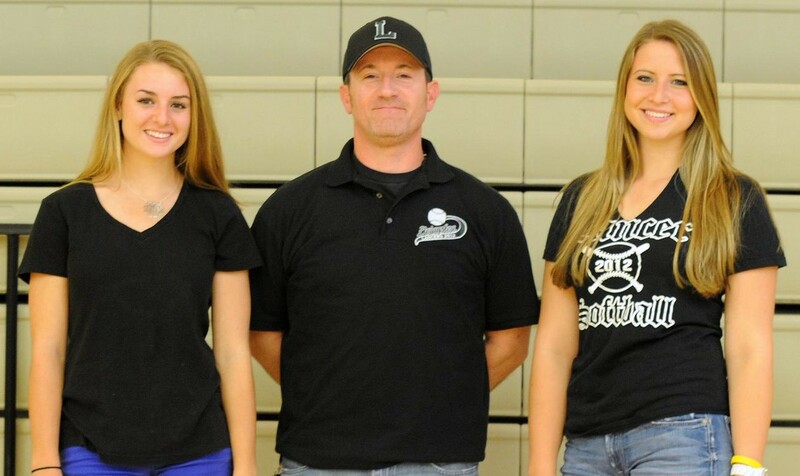 Livingston’s Kylie McLaughlin (left) and Jess Peslak (right, with coach Jason Daily) will be honored by the Men of Essex on May 15. Peslak’s 2012 campaign was one for the ages. She finished 26-1 with a 0.32 ERA while leading Livingston to arguably its best season in the program’s history. Peslak fanned 307 in 175 2/3 innings of work while walking 37. She also spun 19 shutouts, including five-no hitters and nine one-hitters. Peslak fanned a season high 17 in a win over West Essex in the Essex County Tournament semifinals and recorded double figures in strikeouts 20 times. She didn’t allow a run in four Essex County Tournament starts. McLaughlin is the the catalyst to Livingston’s offense. A leadoff batter, she made a big impact in her first varsity season last spring, hitting .486 with a team-leading 51 hits, eight triples and four homers. She also led team with 30 stolen bases while driving in 13. (It may also be noted that today is her 17th birthday as she’ll lead Livingston in an independent game at Edison). According to a letter sent by Livingston athletic director Patrick Genova to the parents of the recipients, the Men of Essex is an Afro American group of men who have been honoring the best of the best scholar-athletes in Essex County for the past 55 years. The majority of students who are recognized are seniors, but sometimes juniors, like McLaughlin, are also chosen for their outstanding accomplishments. The dinner will be held on Wednesday, May 15, at the Newark Airport Marriott. The Men of Essex are also proud that four-time United States Olympian and Columbia High School graduate Joetta Clark-Diggs will be the guest speaker at the dinner. The dinner will recognize students in three categories, National Achievement Finalists, Outstanding Athletic Achievement and Scholar-Athletes. Additionally, the night is culminated by the organization’s biggest accolade, the Essex Award, which Peslak will receive. She is the third from Livingston to gain the honor and the first LHS female so honored. Other Livingston student-athletes to be honored on May 15 include Jonathan Garfinkel (ice hockey), Jamie Schneck (volleyball), Brianna Valese (fencing), Spencer Luster (tennis) and Jason Estevez (wrestling). There was plenty of surprised looks in the stands at Livingston on April 24 when word came that Immaculate Heart Academy, the state’s top ranked softball team, which hadn’t lost a game since the first Obama Administration, had dropped a 1-0 game to Paramus Catholic. But then again, losing a game in late April isn’t that earth shattering. And probably, in the grand scheme of things, a loss may turn out to be a bigger win for the team from Washington Township which will now not have to hear about an extended winning streak and can focus on winning another Bergen County, Big North and eventually, Non-Public A championship. IHA coach Anthony LaRezza usually knows what buttons to push to get the most out of his team, and this won’t be any different. His kids (and the key word there is kids) will rebound and probably, this setback will add a little more fire to an already outstanding team. I often kid LaRezza that the best ‘pep talk’ I ever heard came after his team lost to Livingston at the IHA Tournament in April, 2010. I call it the ‘Memorial Day Weekend’ speech and if you ask him about it, he’ll start laughing. But the point is, LaRezza saw some things that needed to be corrected that day and he felt the message needed to be delivered with some purpose. This time, I don’t think the Memorial Day speech was needed, but LaRezza was direct in his comments to Sean Reilly of Sideline Chatter today. Message sent and Memorial Day is still a month away. Nutley’s last trip to The Stable in Livingston in the Jess Peslak era may have resulted in a 4-0 loss, but the level of respect shared by both teams is further proof that this rivalry be the best in the Super Essex Conference’s American Division. Livingston is nearly unbeatable at The Stable, it’s home field. The Lancers haven’t lost there since April, 2011. Peslak, who is still battling the lingering effects of a virus which has swept through her home, was dominant today, striking out 9 and walking 1 while holding the Raiders to one hit in an economical performance. She had no-hit Nutley a few weeks back, 1-0, in Nutley. The ball was moving well for Livingston’s Jess Peslak and Nutley’s Carly Anderson today. That same respect carried over to the parents of the respective starting pitchers. Peslak’s mom, Jean, made her way to Nutley sophomore pitcher Carly Anderson’s dad, Harry, after the final out was recorded. “Carly pitched a great game, ” Jean Peslak said. “She’s a really good pitcher.” (Ed Peslak, Jess’ dad, was home with the same virus which felled his daughter earlier this week, and it had to be bad, because this guy NEVER misses a game). Back on the field, Anderson was outstanding again, but a four run second inning did the trick for Livingston (12-3). It started with a walk, a 15-foot seeing-eye single and another single to load the bases with no outs. Anderson retired the next two hitters without allowing a run, but then All State centerfielder and leadoff batter Kyle McLaughlin, a slap hitter with power to all fields came up. McLaughlin hit a shot to left field which skidded down the line and the speedy McLaughlin was on her way to a standup grand slam homer. McLaughin was also impressed with Peslak’s performance. Nutley (10-4) got its only hit off Peslak on a one-out single by Heather Williams in the fifth. Morgan Gualtieri drew a one-out walk in the seventh and Nutley’s other base runner was Brittany Currie, who reached on an error in the third. While this was the final regular season game between the two, Nutley and Livingston could meet in the Essex County Tournament final. Zullo was referring to the last time the teams met in the tournament, back in 2011, when the Raiders rallied for two runs in the seventh off Peslak to win, 5-4, despite 14 strikeouts by the-then sophomore righty, in the ECT semifinals. Livingston coach Jason Daily was pleased with his team’s effort today. A third meeting between the two? Who knows? If it happens, see you on May 18 at Ivy Hill Park. The 36th Essex County Tournament was seeded last night with not many surprises. And truth be told, the tournament, over the years, has been seeded well and the ultimate champion is the team that plays the best, anyway. So, while we all enjoy debate over the choices, and I’m as guilty as anyone, when it’s all said and done, this is about the kids who play the game that we as fans and writers, enjoy watching and discussing. The top 10 seeds were Livingston, Mount St. Dominic, Nutley, Bloomfield, West Essex, Cedar Grove, Newark Academy, West Orange, Glen Ridge and Caldwell. My top 10 was Livingston, Mount St. Dominic, Nutley, West Essex, Cedar Grove, Bloomfield, Newark Academy, West Orange, Caldwell and Glen Ridge. Not much of a difference, other than my picking West Essex and Cedar Grove both ahead of Bloomfield. If form holds and the top seeds advance to the quarters, you’d see four outstanding games in West Essex at Bloomfield, to go along Cedar Grove at Nutley, Newark Academy at Mount St. Dominic and West Orange or Caldwell (it’s an 8-9 game) playing at Livingston. But not so fast, because the first round of games, set for May 4, could provide some interesting matchups. Don’t forget, there’s the play-in games first to determine the top 16. Belleville and Montclair are among the schools that will play-in, and hey, you never know there. Last year, Newark Academy went the play-in route, then stunned defending champion and second seeded Nutley in the first round and eventually made it to the semis. In 2010, a major upset occurred in the quarters when unheralded West Orange defeated two-time defending champion Mount St. Dominic before losing to the eventual champ, Cedar Grove, in the semis. Some of the first round games with interest this year could be #12 MKA playing at West Essex in a rematch of a game played on April 22, won by West Essex late; #11 Verona at Cedar Grove, if nothing more than the schools are located a mile apart; Glen Ridge at Newark Academy in what could be anyone’s guess and Caldwell venturing over to West Orange in the traditional 8-9 game. If there are upsets in the first round, the tourney stays on bracket, meaning there are no re-seeds. For example, if Verona upset Cedar Grove, it would still play the winner of the Nutley-Millburn game in the quarters. “Ultimately, the best team wins the tournament,” West Essex coach Andrea Mondadori said. And Mondadori, who led West Essex to the 2007 championship and the 2010 championship game, along with last year’s semifinal, is correct. It all comes down to the kids, anyway. Following the play-in games, we’ll have previews of the May 4 first round games. The quarterfinals are set for May 11 at the home of the higher seed, followed by the semifinals at Ivy Hill Park on May 17 and the finals on May 18, also at Ivy Hill. In the meantime, there’s plenty of tough Super Essex Conference games awaiting, including today’s Popcorn Supreme at Livingston when Nutley comes to town. These two played a great game a few weeks back, won by Livingston, 1-0. Then again, most Livingston-Nutley games are tremendous, most notably the 2011 ECT semi which Nutley won, 5-4, and a regular season, extra inning thriller in April, 2012, won by the Lancers, 3-2. Word is that Livingston pitcher Jess Peslak should be in the circle today. The senior missed Monday’s game with Bloomfield and played sparingly on April 23 at West Orange as she battled back from an illness. So, as I always say, Get your Popcorn Ready. His team had just defeated Bloomfield, 10-3, in a Super Essex Conference (SEC) cross over game on April 22, but Livingston coach Jason Daily wasn’t in a celebratory mood. Bloomfield, which plays in the Liberty Division this year, a conference considered strong, but not as tough as the American, where Livingston resides, came into its game at top-ranked Livingston with an 8-1 record. With Livingston pitcher Jess Peslak shelved by an illness for the game, it appeared Bloomfield might have an edge as it hoped to gain a few spots in the seeding for the upcoming Essex County Tournament. The game went back and forth, as both teams made errors, and was tied at two heading into the bottom of the fifth. There, Bloomfield’s defense faltered and Livingston, a team you can’t give additional outs to in the first place, scored six unanswered to make it 8-2. Get your popcorn ready for the 36th annual Essex County Tournament. Bloomfield, however, battled back in the sixth, scoring a run and loading the bases with two outs before Daily called on Jazzy Pignatello to put out the fire and the senior right hander did just that, inducing a pop up to end the threat. Sophomore Sami Passeri had pitched the first 5 2/3 innings, showing good control, before Pignatello entered. Some of Bloomfield’s outs were of the long fly variety, but since Livingston doesn’t have a fence and sports a solid outfield led by All State centerfielder Kyle McLaughlin, some of those 200 foot-plus fly balls were outs. Livingston’s infield defense also saved some runs by snaring hard hit Bloomfield drives, as well. There’s no way of knowing how hard Bloomfield would have hit had Peslak pitched, but the bottom line is the Bengals can play, as long as its defense holds up. As far as rankings for the upcoming Essex County seeding meeting tonight, there are some slight changes to the FMTC Top 10. Most notably, Glen Ridge drops down after losing to West Orange and Newark Academy is up to No. 7 after beating Caldwell. In my opinion, these are the top 10 seeds, as well. Bear in mind, if Glen Ridge beats Bloomfield today, then Newark Academy moves to 6 and Bloomfield would fall to 7, with all the other rankings remaining the same. It’s no surprise that two local high school wrestling programs have coaches who not only excelled at the sport as scholastic athletes, but put an incredible amount of additional work into making the programs they now oversee an example of all that is right with high school athletics. Recently, I had the chance to attend the end-of-year wrestling banquets for both Nutley and Passaic Valley High School. Both programs had outstanding seasons in 2012-2013, with Nutley winning a second straight Essex County and District 14 championship while Passaic Valley captured a Big North title and came within a half point of winning a second consecutive District 13 title. Nutley coach Frank DiPiano was influenced by his legendary father, Mike DiPiano, Sr., (right) at an early age. Both programs took wrestlers to the ultimate tournament, the state championships at Boardwalk Hall in Atlantic City. 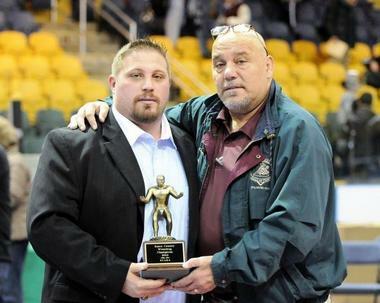 Nutley coach Frank DiPiano and Passaic Valley’s Joe Benvenuti grew up in pretty much the same generation of high school wrestling. Both succeeded, with Benvenuti wrestling at PV before beginning his coaching career at West Essex while DiPiano starred for his father at St. Benedict’s before becoming an assistant coach at Nutley. 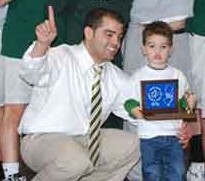 Joe Benvenuti of Passaic Valley, celebrating a team title in 2010 with his older son, won his first conference title at PV this winter. The two are the lead officers for Region 4, and it’s no surprise that their dedication to the wrestlers they serve, as well as their good humor and integrity, go a long way in establishing their region as one of the best in New Jersey. As I said, I attended both dinners (Nutley’s was held on April 22, PV’s on April 17) and it wasn’t surprising to see many similarities in the way the events were managed. There were numerous thanks to the parents, as well as others who supported the programs, because both guys know what it takes to not only make a team successful, but to keep it that way. And it wasn’t surprising to see the respective athletic directors, Nutley’s Joe Piro and PV’s Patty Lynch in attendance and seemingly very proud of what the teams accomplished. At Passaic Valley, Superintendent Dr. Viktor Joganow is always a presence at matches and at the post-season events while Nutley’s wrestlers were formally recognized by the Board of Education minutes before its dinner. But most of all, it was the wrestlers themselves, dressed professionally in shirt and tie, and the seniors giving heartfelt speeches of their days as a Raider or Hornet that really stood out. That integrity, of course, is shaped in the earliest of years by parents, but later is enhanced by competing in sports, and learning from coaches who truly get it. One thing I’ve always said about high school-aged athletes is they can spot a phony from a mile away. And they can also spot the real deal. And when young men like Robert Trombetta of Nutley and Passaic Valley’s Nick Armagno go out of their way to not only say how they love their parents and family, but single out their head coaches for all they’ve taught them, not only about a wrestling move, but about life and how DiPiano and Benvenuti are ‘second fathers’ to their already great dads, that’s the ultimate compliment. So, congrats to two excellent coaches and even better men, for providing young men the ability to thrive in a culture of pride and integrity.